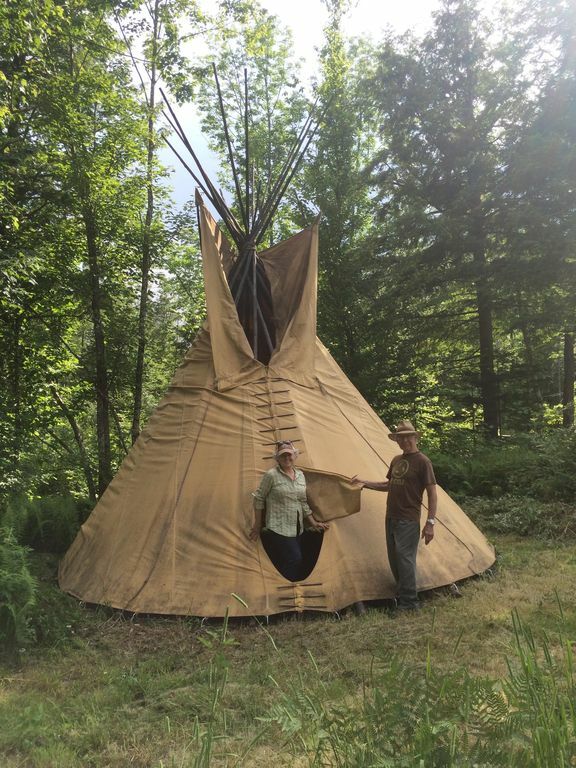 Take the opportunity to spend a night in a traditional tipi. Our 45 acres is surrounded on all sides by national forest, yet minutes away from a wonderful general store. Beautiful mountain setting with great star gazing and bird watching. This is in a rural setting and a water purifier or water should be brought. Be prepared with ground cover or tarp, sleeping bags and other camping equipment. Swimming hole located just a short walk from the tipi. There is a composting toilet located near the barn. Guests are asked to pack in and out trash and leave no trace. Composting toilet is located by the red barn just a few minutes from the tipi. Park next to the barn and walk to the other side of the field past the blue berry bushes. Please read all steps before departing and print these directions. There is not consistent phone service or GPS. There is a locked gate with code 1229 Keep gate shut at all times. Your tipi is in the field near the barn. Hard to see it at night so walk to the end of the field to find it. From Conway area take 113 north. Go to the Stowe, Maine general store at the junction of 113 and 113B. Keep store on your left and continue on 113B. Stay on 113B until it comes to a junction with the church about 2 miles. Keep straight on to toad hill road. It's a well maintained dirt road. After about one mile. At the fork go right, there is a house in the middle of the fork. Please go slow. The sign says road not maintained and logging operation. The road is fine for normal cars and is maintained privately. After half a mile you will come to the gate. Next you will find the barn. Please park there. The tipi will be on the other side of the field about a two minutes walk. Please leave the same way you came in. You can drive to the end of toad hill road. This road is plowed only after storms so be careful not to get plowed in. From there walk 15min to the barn. At the barn go left down the road and the tipi will be visible within a few minutes. Park at the bottom of the hill where the fork is and ski or walk up Langdon brook road take a right at the top of the hill and the tipi will be on the right. The other option is to go up toad hill road and follow the previous directions.